Maximiano Augusto de Oliveira Lemos Júnior was born in S. Faustino, Peso da Régua, on 8 August 1860. On 30 September 1876, he enrolled in the Porto Medical-Surgery School, having passed the examinations in Chemistry, Physics, Zoology and Botany at the Polytechnic Academy, where he had been admitted on 12 October 1875. On 16 July 1881, he completed the course in Medicine and Surgery and defended his thesis. In 1889, he worked as a substitute teacher in the medical department and six years later taught Forensic Medicine (1895), a formal position he would occupy five years later (1900). Between 1895 and 1900, he occupied the chair of General Pathology, in which History of Medicine was taught, and in 1916 he was awarded the recently created chair of History of Medicine, which he occupied until he died. 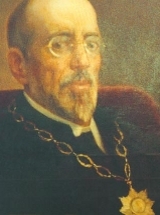 He was the Head of the Faculty of Medicine (1918-1922), Vice-Rector of the University of Porto (1921), Effective Partner and President of the Society of Medicine and Surgery of Porto, and Corresponding Member of the Academy of Sciences in Lisbon, of the Society of Medical Sciences in Lisbon, of the Portuguese Society of Natural Sciences, of the Society of Medicine and Surgery in Baía, and of the German Society of History of Medicine and Natural Sciences in Leipzig. Maximiano Lemos became famous as a researcher of History of Medicine in Portugal, and wrote several books, for example: "Anuário dos Progressos da Medicina em Portugal" [Yearbook of the Progress of Medicine in Portugal] (1884), "História da Medicina em Portugal – Doutrinas e Instituições" [The History of Medicine in Portugal - Doctrines and Institutions] (1899), "Amato Lusitano – a sua vida e a sua obra" [The life and work of A.L.] (1907), "Zacuto Lusitano – a sua vida e a sua obra" [The life and work of Z. L.] (1909), "Ribeiro Sanches – a sua vida e a sua obra" [The life and work of R.S.] (1911), "Camilo e os Médicos" [Camilo and the Doctors] (1915-1921), a "História da Medicina Peninsular" [The History of Peninsular Medicine] (1916), "Gomes Coelho e os Médicos" [G.C. and the Doctors] (1922) and "História do Ensino Médico no Porto" [The History of Medical Education in Porto] (1925). He died in Vila Nova de Gaia on 6 October 1923.